In order to raise Flemish Giants properly, they require housing larger than the average sized rabbit. Our rabbits are kept in pens that are built to allow access to the outside of the building. This provides indoor shelter and outdoor access to fresh air. Our rabbits are raised in barns that are temperature controlled/climate protected; complete with high velocity fans that continually circulate air throughout the cages, creating a gentle breeze on the hottest days. 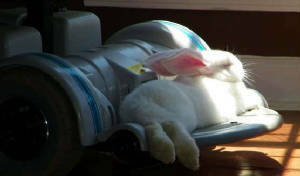 All rabbits, especially the Flemish have to be protected from over-heating. Rabbits do not handle extreme heat. Temperatures over 90 degrees F can be life threatening. Flemish Giant rabbits are not bothered by cold temperature. If keeping your rabbits outdoors, look for shady areas to protect them from sun and heat. Rabbits must be sheltered from rain and snow, heat and wind. Flemish Giants need exercise and are playful and affectionate. As with any companion animal, the more attention you give them, the more they will reciprocate. Flemish Giants can be litter trained just as easily as a cat. 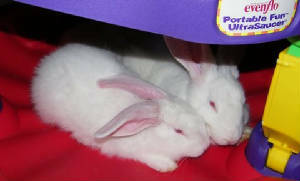 Rabbits are very clean animals and do not require bathing. Spayed or neutered, they make excellent supervised house pets. Rabbits should be confined when alone to deter chewing on harmful or valuable items.